Our Physiotherapists are experts in the management of musculoskeletal injury. At Spring Physio Gym we use our knowledge of the body, injury, healing and exercise prescription to maximise your return to best function following injury and prevent recurrence. Starting with an initial appointment your physiotherapist will perform a careful assessment of your injury and develop a management plan to bring you back to your full potential. Your treatment may involve manual techniques such as joint mobilisation and massage and exercises such as stretching or strengthening. Manual techniques such as joint mobilisation or massage to release muscle spasm or mobilise stiff joints. Our Chronic Low Back Pain Clinics offer a detailed assessment of your chronic low back pain, using state of the art technology known as ‘Vi Move’. Vi Move is a way of objectively assessing and monitoring your lower back postures and movements using 4 wireless sensors with real-time visual feedback. Clinical Pilates is a method of exercise taught by physiotherapists. It involves training and recruiting your postural muscles more efficiently. At Spring Physio Gym Clinical Pilates is taught 1:1 or in small classes, and involves floor and mat exercises. You commence with two 1:1 sessions. The first session involves your assessment, and the second constitutes a program design. Your physiotherapist will take you through the basics of core stability and begin to build your program with you, in the gym. Please wear comfortable clothing to these sessions. There are many health conditions that are unique to women and the various challenges in their life. The most obvious are the effects of pregnancy and childbirth. Other issues that can affect women in particular relate to the fear and avoidance to exercise due to issues with incontinence. At Spring Physio Gym we have highly trained physiotherapists to help assess and manage these challenges and help get you exercising in a safe and effective way without risking further damage to your pelvic floor. We offer comprehensive services to rowers to improve their techniques and manage their injuries. The rowing program is managed and overseen by Fiona Milne, our senior physiotherapist and co-partner of Spring. Fiona has competed in rowing at an elite level for over 7 years, representing Canada in the 2000 and 2004 Olympics, and competing in World Cup and World Championship events. 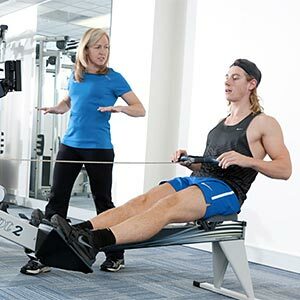 Fiona holds a Level 2 qualification in rowing coaching and is well qualified to lead the rowing focus here at Spring Physio Gym. Clinical Vi Move is a wireless system of sensors that measure movement and muscle activity in the spine. From simple movements such as a step-up, to more complex movements like a cricket bowling action. The assessment takes 60 minutes starting with standardised postures and progressing to an analysis of specific actions relevant to your work, sport or daily activities. Our physiotherapists will utilise the Vi Move to help retrain your movement with live feedback from the sensors. Biomechanical assessment means to look at your technique of an activity such as running or walking and analyze the way forces act on your body. Bio = related to the body and mechanics = study of physical forces. At Spring Physio Gym we have trained physiotherapist to analyse your running and walking technique. Through this process we can identify inefficiency that may contribute to injury or sub maximal performance. We offer tailored personal training to optimize your cardiovascular fitness and strength. Bill Dooley from Made to Move, is experienced with working with clients including the sporting population and people with long term injuries. Bill works alongside our physiotherapists to ensure a safe environment for exercise and allow for regular inter-referral where needed. So if you find that you are getting sore in your sessions we can refer you to the physiotherapist and, equally if you are ready to be pushed to the next level of fitness, then Bill can get you there.